Life with Lucie & Ella: Summer Survival Guide Sale - only $5! Summer Survival Guide Sale - only $5! Summer is half-way through and Fishmama is having a sale on her latest ebook. 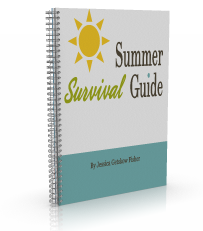 For just $5, you can get your own download of the Summer Survival Guide! You can either use it for the rest of the summer or save it for next year. It was a great deal at full price, and now it's an even better deal at half off. The ebook is on sale now through the end of the week. Don't miss out! A 200+ page ebook full of summertime inspiration for planning family fun. Includes 38 printable and/or customizable pages as well as ideas for home management, emergency preparedness, family fun, and more.